I have procured so much beauty content over the last few weeks that I’ve decided to make April all about beauty. For the next few weeks, I’ll be sharing some of my fave products/services/tips&tricks surrounding everything to do with beauty, skincare, hair, etc. So to start us off, I want to share with you the most #instaworthy Medical Spa I’ve ever seen in my life, The Clinica. This place is still relatively new, but it has BLOWN UP with Toronto skin and beauty lovers. The brand has been all over my Instagram stories, and likely a few of your other fave Toronto bloggers as well. They specialize in personalized skincare that is a perfect match for your individual skin concerns. Offering treatments for the face and the body, their signature treatment (that is buzzing right now) is the “Miracle Cocktail”, but more on that later. The Clinica is located at Yonge and Sheppard inside the Hullmark Centre, which is super convenient because it’s right on the subway line and near by parking. Once inside, you’ll understand why I’m completely obsessed with the place. Everything is baby pink, white, beige, etc; perfect pastels for Spring. The treatment rooms are clean, and carry on the same aesthetic as the lobby, showcasing all of the Alumier MD products that they use on their clients. To top it all off, they’ve hung inspiring quotes all over the place to help you boost your confidence and leave you feeling like you can conquer the world. Let’s talk treatments. As I mentioned, their signature treatment is the “Miracle Cocktail” facial. However, they offer a variety of other treatments as well. From peels, to Botox and fillers, and even laser hair removal, The Clinica is a great place to head whenever you’re in need of a little TLC. Obviously a med spa is a little different than a regular spa you’d find at a hotel (no white robes here), but they are definitely promising and delivering visible results. I was kindly offered the Miracle Cocktail facial, which, if I’m being honest, is quite an investment in your skin. Their prices are pretty reasonable across the board, but this one is definitely on the higher side (and for good reason). The process is pretty in-depth which I appreciate. I started off by filling out a survey that asked about my medical history, skin concerns, and what I’m using/doing to remedy them. This helped my Skin Specialist, Tracy, to better get to know my skin. Once we chatted a bit about what products I use on my face, she conducted a deeper analysis of my skin. This involved her taking a series of 6 photos of my face in order to see any underlying damage and scarring that was sitting below the surface. 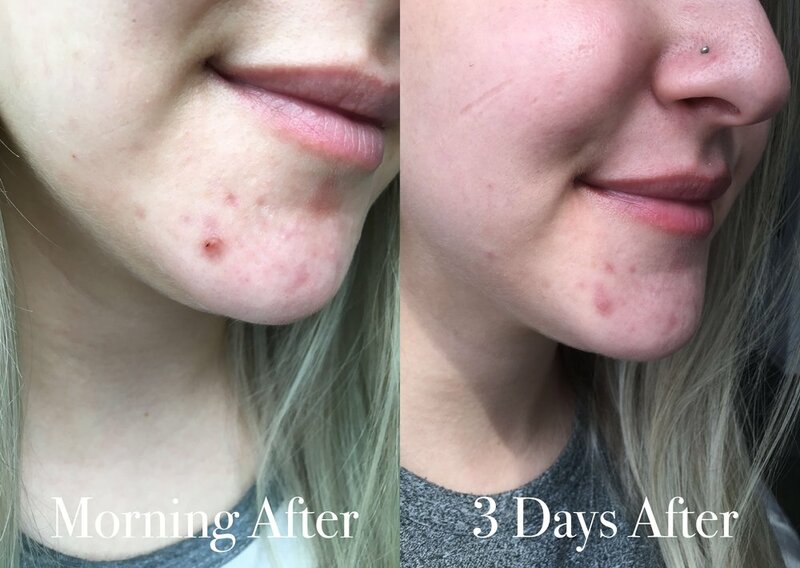 As someone who struggles with acne, it’s no surprise there was a good amount of scarring and pigmentation on and around my chin. She also pointed out a few spots where I could be exfoliating better due to excess oil production and some congestion deeper set in my pores. These notes helped to drive the rest of the appointment. This treatment is unlike any other I’ve had before. It started off like a regular facial. Tracy cleansed my skin of any products that I had applied that morning, and to start with a clean canvas. Then, she applied a pineapple and papaya enzyme to exfoliate and retexturize my skin. This helped to clean out some of the deeper set congestion that I was unable to reach at home. Tracy let me know that your at-home exfoliants typically reach the first 2-3 layers of your skin, but really, you’ve got anywhere from 10-20 layers. Think about all the dirt and grime you’re likely missing when you wash your face! That is one of the main benefits of this treatment, it allows for products to penetrate those lower layers of your dermis. Once she cleared away the enzyme mask, out came the needles. At first I was freaked out, I don’t want needles in my face! However, Tracy explained the process to me and calmed my nerves. The needles essentially create microscopic openings in the surface of your skin, causing it to trigger the production of new and healthy skin tissue and collagen. It also creates channels for the skin-loving serums to reach further down in your dermis. I wouldn’t say it felt painful. In fact, when she reached some areas of my face like my cheeks, it was pretty relaxing. The only time I experienced any discomfort was when she went over the areas with more concentrated scar tissue like my chin. She explained that this was normal, and that those spots were more rigid and often go as deep as nerve endings and muscle tissue. 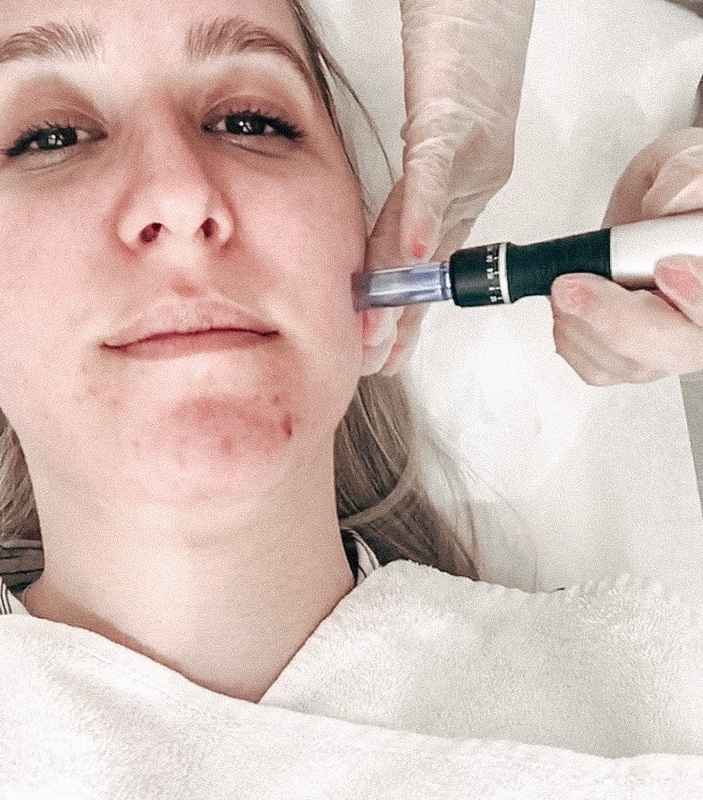 What’s great about this treatment, is that your Skin Specialist can actually change how deep the needles go depending on what your intention is. For me, we didn’t go very deep, but if you wanted to do some more intense resurfacing on wrinkles or scars they would likely increase the intensity. Don’t worry though, they use a numbing cream so that it doesn’t cause you pain. Serums are my favourite part of any skincare treatment/routine. This is where you can truly customize to fit your skin. Tracy asked if I wanted to do the advanced version of the Miracle Cocktail, which includes prescriptive grade ingredients like Botox. Right off the bat, I was unsure about how I felt about it. I know of the preventative nature of Botox injection, but I’m not quite there yet in my skincare journey. Still, Tracy explained that this was different than the Botox method I knew and “loved”. Instead of injecting it into the muscle to relax it for a number of reasons, it is “injected” via microneedling. This method is applied in serum form, and is actually really good for those dealing with acne and over-production of oil. It shrinks pore size, and reduces excess sweating to starve off acne-causing bacteria. Count me in for this kind of Botox! I know this is all you actually care about, because you want to know if it’s worth the money. As I mentioned, this treatment is an investment in your skin. If you’re like me, and you care a lot about what products you’re using on your face, as well as keeping your skin healthy from a young age, it’s way worth it. Anything that can heal active breakouts and prevent future ones from occurring is enough to convince me. And keep in mind that this isn’t only for those dealing with acne. It’s great for hydration, promoting collagen production, and treating damaged skin. If you are content in using your drugstore products, and don’t necessarily value spending money on skin, that’s ok too. This is not the treatment for you, but you can spend your hard earned money wherever you see fit, as always. Sometimes the basics are just as good! In terms of results, it’s only been a few days but my skin looks great. The active breakout I had going on for most of the week has subsided and is now mostly a scar. She couldn’t get too close to it in fear of spreading acne-causing bacteria, but even what she did do helped it heal way faster than normal. The scarring I have from years of acne has lightened a significant amount. Some of the more stubborn ones are still kind of dark, but overall my skin looks more even post-treatment. The biggest change that I’ve noticed thus far is the amount of product I have to use at home. Tracy suggested I wait til the next day to wash my face in order to let all the products work their magic. When I did eventually cleanse my skin at home, everything absorbed way quicker than before. I’m using less product to achieve the same results. Do you invest in skincare? Is the Miracle Cocktail something you’re interested in trying out? If so, head over to The Clinica before April 15th for 30% off all non-injectable treatments, and mention my name for an additional 5% off! What are your holy-grail skincare investments? Share with me in the comments.